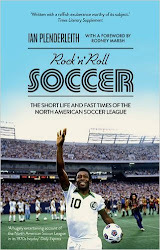 ROCK N ROLL SOCCER: Pelé salutes the readers of Rock n Roll Soccer! 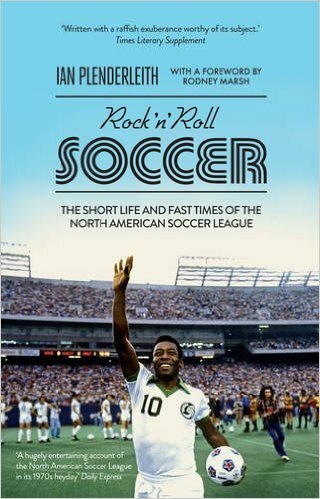 Pelé salutes the readers of Rock n Roll Soccer! a cheap(er) copy of Rock n Roll Soccer. The trade paperback version of Rock n Roll Soccer is published today in the UK. Don't ask me what "trade paperback" means. The first edition was just a plain old paperback for £14.99, the trade paperback is a wee bit smaller and costs six pounds less at £8.99. But calling it the "cheap paperback" probably wouldn't do much for sales. Everyone likes a bargain, but no one wants to be told they're buying low grade goods. Pelé, as you can see, is on the cover this time. For the plain old expensive paperback we went with Rodney Marsh and George Best and The Bloke Between Them, who turned out to be their agent, but was managing to look like a member of The Eagles - so the photo fit the title. While writing the book, I caught up with the agent by phone from California, where he's now in property. He couldn't remember much about the North American Soccer League, but vehemently denied the allegations in former Washington Diplomats' striker Paul Cannell's book that following a sponsorship deal, he once paid the Geordie striker in lieu of cash with a fat pouch of cocaine. Three-times world champion Edison Arantes do Nascimento, though, sells more books than some dodgy no-name former wide-boy, so the agent's been despatched to the archives and the cover shows what I'm claiming in the book the NASL was not all about - Pelé, the Cosmos, razzmatazz blah blah blah. But I realise that's not what grabs a reader's attention. Every time I hand someone a copy of the book, or see them pick it up, the first thing they do is flick to the pictures in the centre. Every single person. Pictures, fellow hacks - if you're writing a non-fiction book, don't forget the pictures. Preferably of easily recognizable people. Pelé is delighted to be on the front cover - you can tell from his face. You may quibble that he didn't know when he was running out on to the field that he was going to be on the front cover of Rock n Roll Soccer some four decades later. But you can't prove that he didn't. And that he's waving, "Buy! Buy!" It's what the game's been all about since the day he signed for the Cosmos.